Well, The Big Bang Theory keeps on going and while it's tone largely remains unchanged, it feels like more and more folks are using this lack of change as an opportunity for greater criticism about the tone of the show and how it doesn't handle certain gender issues well. We're in that point in our lives. For me, well, my desire to watch the show has waned somewhat and it's no longer something I rush to see but something I might consider watching once seasons hit streaming services much later in life. Currently I rely on iflix for episodes of past seasons in part of my catch-up efforts to write this review. I've long said the show feels like Friends with geek trappings around it and that remains all the more true given the expanded primary cast. It has decent moments and I still root for the girls more than the boys but I can see that the writers aren't doing too well in terms of balancing development for all characters and making things less cringey in terms of how it writes things for women, especially in relation to the guys. 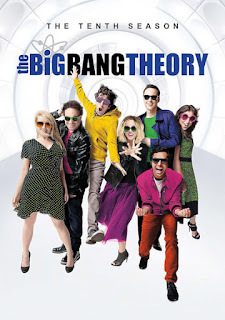 Synopsis: The Big Bang Theory is an American sitcom created by Chuck Lorre and Bill Prady for CBS. The show is still projected to run for 12 seasons in total pending their next contract review. This season begins with the second marriage ceremony for Leonard (Johnny Galecki) and Penny (Kaley Cuoco) mainly for the benefit of their parents who were not present for the first shotgun wedding. There are some interesting developments between Sheldon's mother and Leonard's separate father but that'll take time to pan out. In the meantime the military has once again contacted Howard (Simon Helberg) given interest in the guidance system they were working on. The military project becomes a major focus for the season with pretty much everyone working on the project. But in other news a plumbing proble creates an opportunity for Sheldon (Jim Parsons) and Amy (Mayim Bialik) to try living together while her apartment is under going repairs for the damage. Bernadette's (Melissa Rauch) pregnancy continues on. And Raj (Kunal Nayyar) is oddly involved in the pregnancy. What I Liked: The guidance system project certainly gave the primary cast something to focus on for a change and a reason to be together. I guess one could only buy into mainly seeing them meet in the cafeteria for so long. The project does put a lot of stress on them and stress always makes for good comedy fodder like Sheldon trying an energy drink for the first time in his life. Amy and Sheldon sharing an apartment was also quite interesting and maybe even endearing at times as it's nice to note how far Sheldon has grown as a character. From a buy who could barely stand being touched we now have regular references to him being intimate with Amy beyond their supposed annual commitment. I also rather enjoyed the machine that could supposedly read emotions better than Sheldon. That was ridiculous but made for good laughs. What Could Have Been Better: Like what I said in my review of the prior season, I'm really concerned about the lack of growth for Raj and how he's now just a weird extension of the Howard and Bernadette family. Dogpiling Stuart (Kevin Sussman) on top of everything as yet another complication in their home life didn't make things any better and creating a sibling rivalry situation between the two just didn't do much for either character. They tried the whole Raj getting cut off from his parents bit later in the season but it still didn't really do much for the character. Bernadette is in a similar trap as all that can be discussed is the fact that she's pregnant. At least she got the mini-arc about her being worried her pregancy would lead to problems at work but that was a one episode throwaway thing that didn't go anywhere either. Stuart probably gets more interesting lines that she does in this season, as weird as that is. TL;DR: The Big Bang Theory is definitely at that point when you can't help but ask how long this show is really going to try to go for and what stories it has left. I don't think the writers really know what they want to achieve either and that lack of direction is hurting the show. And thus this season only gets 3 challenges facing the guidance system project out of a possible 5.